Editor’s note: Due to the upcoming Thanksgiving holiday, the Academy will not publish This Week next week. The next issue will be published on Friday, Nov. 30. Academy volunteers gave a series of presentations this week at the NAIC Fall 2018 National Meeting in San Francisco, addressing a variety of life, health, casualty, and professionalism topics. Donna Claire, chairperson of the Principle-Based Reserves (PBR) Governance Work Group provided an update on the Academy’s involvement with principle-based reserves. Claire also alerted attendees about the Academy’s 2019 PBR Boot Camp, scheduled for April 8–10 in Orlando, Fla.
Chris Conrad, vice chairperson of the SVL Interest Rate Modernization Work Group, gave an update on the modernizing the process of setting valuation interest rates for all non-variable annuities. John Miller, co-chairperson of the Annuity Reserves Work Group, presented an update on recommended changes to VM-22. Arnold Dicke and Sheldon Summers gave a presentation on behalf of the Life Reinsurance Work Group on potential issues relating to VM-20 Credit for Reinsurance. Academy volunteer Dave Plumb presented a new issue brief that looks at long-term care (LTC) insurance. Warren Jones, chairperson of the Academy’s LTC Combo Valuations Work Group, gave an update to NAIC’s LTC Actuarial Working Group. Barb Klever, chairperson of the Individual and Small Group Markets Committee, presented updates on the Academy’s Health Practice Council (HPC) activities at NAIC’s Health Actuarial Task Force (HATF). Academy President Shawna Ackerman provided an update on the latest activities of the Academy’s Committee on Property and Liability Financial Reporting and Casualty Practice Council (CPC) to NAIC’s Casualty Actuarial and Statistical Task Force (CASTF). The Academy’s HPC/ CPC joint work group also gave an update on bond risk-based capital factors. Academy Past President Mary D. Miller, Actuarial Standards Board (ASB) Chairperson Beth Fitzgerald, and Actuarial Board for Counseling and Discipline member Godfrey Perrott presented updates on Academy professionalism activities, including to CASTF and HATF. 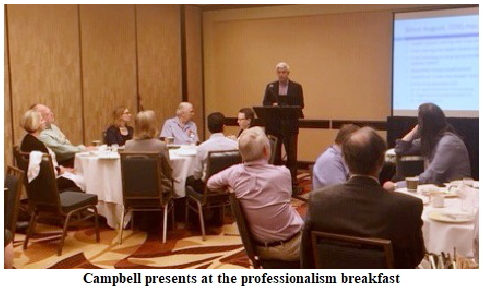 The Academy also hosted its usual regulator-only professionalism breakfast and discussion forum on Thursday, at which Miller, Fitzgerald, and Perrott, along with Tom Campbell, representing the Academy’s Committee on Qualifications, presented and took questions at the well-attended session. The Academy plans to release a post-NAIC alert on the meeting later this month and will be hosting a webinar next month recapping its top life issues. The Academy’s election vendor, Intelliscan, provided the official results of the online and mailed votes cast by eligible members on two proposed changes to the Academy Bylaws. Proposal 1, a change recommended by the Academy Board of Directors, won a majority of votes but not the two-thirds supermajority required to be incorporated into our bylaws. Proposal 2, initiated by petition, was voted down decisively, with 57.99 percent of votes against. As a result of these two votes, the Academy Bylaws remain unchanged. Read the member update. The Academy will host a webinar, “Big Data and the Role of the Actuary,” next month. The webinar will draw from the Academy’s Big Data Task Force monograph of the same name that was released in June. Task force member panelists—Academy Health Vice President Audrey Halvorson, Bob Miccolis, and Martin Snow—will discuss current and emerging practices, important regulatory and professionalism considerations, and the current state of the InsurTech field. Task force Vice Chairperson Dorothy Andrews will moderate. The Academy believes this event constitutes an organized activity as defined under the current Qualification Standards for Actuaries Issuing Statements of Actuarial Opinion in the United States, and that attendees may earn up to 1.8 continuing education credits for attending the live webinar, which will be held Dec. 19 from noon to 1:30 p.m. EST. Register today. Academy President Shawna Ackerman and Executive Director Mary Downs attended the Casualty Actuarial Society’s (CAS) Annual Meeting in Las Vegas earlier this week to honor Brian Brown on his year as CAS president and congratulate Jim Christie as he begins his year as CAS president. There were many other Academy members and staff at this very well-attended meeting, and ASB member Christopher Carlson and incoming ASB member Pat Woods took part in a roundtable on how the ASB operates. The Academy published a new Essential Elements paper, “Big Data, Big Changes for Insurance and Pensions,” which highlights the opportunities and challenges that rapidly evolving advancements in data analysis and storage pose for insurers, consumers, and regulators. The Essential Elements series is designed to make actuarial analyses of public policy issues clearer to general audiences. The November HealthCheck recaps health highlights from the Academy’s Annual Meeting and Public Policy Forum, including a reference pricing session that was livestreamed (and is available for replay) on the Academy’s Facebook page. Also in this issue: the Life and Health Qualifications Seminar; the results of health-related Election Day ballot measures in several states; and recent state and federal legislative and regulatory activity. 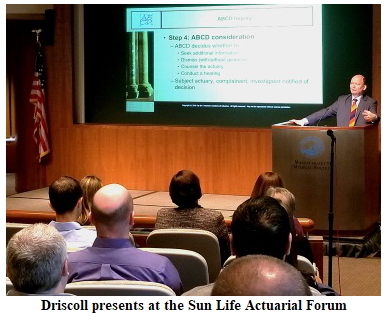 Actuarial Board for Counseling and Discipline (ABCD) member David Driscoll reviewed the role and function of the ABCD for more than 100 actuaries attending the Sun Life Financial Actuarial Forum in Waltham, Mass., on Thursday, walking attendees through case studies with discussion of relevant ethical and disciplinary considerations. Academy Past President Ken Hohman’s presentation to attendees of the Columbus (Ohio) Actuarial Club’s meeting on Friday examined lessons learned from public discipline and the operation of the disciplinary process, and discussed how disciplinary considerations can inform ethical practice. The five-year moving average of the Academy-co-sponsored Actuaries Climate Index™ (ACI) rose to a record 1.23 for winter 2017–18, compared with 1.19 in fall 2017, according to data released this week. The seasonal ACI value was 1.08, compared with 2.00 in the fall. The ACI is co-sponsored by the Canadian Institute of Actuaries, the Casualty Actuarial Society, and the Society of Actuaries. Read the Academy press release. The Joint Board for the Enrollment of Actuaries (JBEA) is seeking applications for the next term of the Advisory Committee on Actuarial Examinations, which begins on March 1, 2019, and ends on Feb. 28, 2021. The JBEA asked the Academy to make this opportunity known to our members. The Advisory Committee plays an integral role in assisting the Joint Board to offer examinations that test the knowledge necessary to qualify for enrollment. Its duties include recommending topics for inclusion on the Joint Board examinations, reviewing and drafting examination questions, and recommending passing scores. Information on how to apply is available via the IRS website. Applications are being accepted through Dec. 7. The federal Office of Financial Research published its 2018 Annual Report to Congress, describing key research findings and highlighting priorities for 2019 and beyond. The report assesses potential threats to U.S. financial stability and provides the status of the agency’s efforts to support the Financial Stability Oversight Council and agencies represented by council members. Read the Academy alert. The International Accounting Standards Board voted Wednesday to propose a one-year deferral of the effective date for Insurance Financial Reporting Standard (IFRS) 17 Insurance Contracts. The new effective date will now be Jan. 1, 2022. PBR Boot Camp—April 8–10, 2019, Orlando, Fla.
Plan Sponsor and Plan Adviser reported on the ASB’s Actuarial Standard of Practice No. 51, Assessment and Disclosure of Risk Associated with Measuring Pension Obligations and Determining Pension Plan Contributions, which took effect Nov. 1. Actuarial Review, the bimonthly magazine of the Casualty Actuarial Society, reported on the Academy’s jointly sponsored Actuaries Climate Index, which provides a quarterly gauge of changes in extreme weather events and sea levels. Wolters Kluwer Law & Business cited the Academy’s issue brief on association health plans. 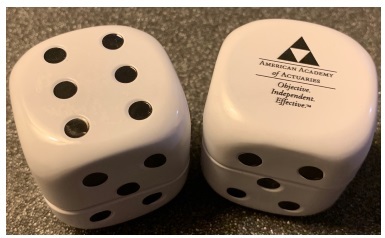 Copyright 2018 American Academy of Actuaries. All rights reserved.